COPD is an acronym that stands for Chronic Obstructive Pulmonary Disease. 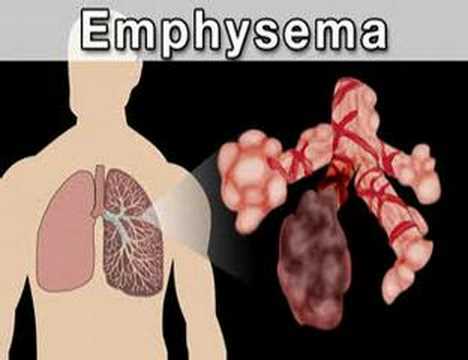 It is used as a generic term to cover chiefly chronic bronchitis and emphysema, since these are the two major lung diseases, which obstruct airways. In the U.S alone, official estimates of COPD victims range anywhere from twelve million to thirty two million and according to the Merck Manual, it is the fourth leading cause of death in the country, killing more than one hundred and twenty thousand folks every year. In chronic bronchitis the lining of the bronchial tubes, which branch off the trachea and lead to the alveoli, become swollen and fill with mucus. That blocks airflow and increases chest pressure. In emphysema, the alveoli, which are the tiny sacs that exchange oxygen and carbon dioxide into and out of the blood, become irritated. Ironically, the obstructive character of COPD does not reduce air intake. It actually traps air inside the lungs, reducing the efficiency of exhalation. That makes it more difficult to breathe. In addition, it lowers the number of capillaries in the alveolar walls, reducing the efficiency of oxygen-CO2 exchange that is central to respiration. Subsidiary effects include increased blood pressure in the arteries, as the body tries to compensate for lower oxygen levels. At the same time, the disease stimulates bone marrow, which is the source of new red blood cells, to increase production. The exact causes of Chronic Obstructive Pulmonary Disease are unknown, but there are several risk factors strongly correlated with the illness. Long-term cigarette smoking is known to irritate airways and injure the ability of alveoli to recover from its effects. Occupational exposure to certain chemicals and dust, such as one type of asbestos not commonly used in buildings are another risk factor. Genetics plays a role, although how large and exactly how is still under investigation. Symptoms of COPD include a newly developed chronic hacking cough, one that is not an effect of a cold and persists for more than a couple of months. The cough typically produces sputum, which can be examined as part of a diagnosis. Shortness of breath, called dyspnea, is an overwhelmingly common symptom among COPD sufferers, since both chronic bronchitis and emphysema reduce oxygen-absorption efficiency. Patients may also cough up blood, an event known as hemoptysis. However, since all these symptoms can also accompany lung cancer and other diseases, only a professional diagnosis can determine the actual condition. Other symptoms will be taken into account during that procedure, including cyanosis, for example. Due to reduced oxygen absorption, the skin turns slightly bluish. Physicians can also gain clues from the shape of the chest, since COPD tends to produce a barrel shape from muscle realignment as the body compensates for the disease. Tragically, many COPD cases are progressive. However, while there is no known cure for Chronic Obstructive Pulmonary Disease in any of its forms, treatments can lessen the severity of symptoms and prolong survival. Changes of lifestyle are often imperative, such as cessation of smoking and reduced activity. Nevertheless, with accurate diagnosis and proper treatment, COPD need not be fatal.